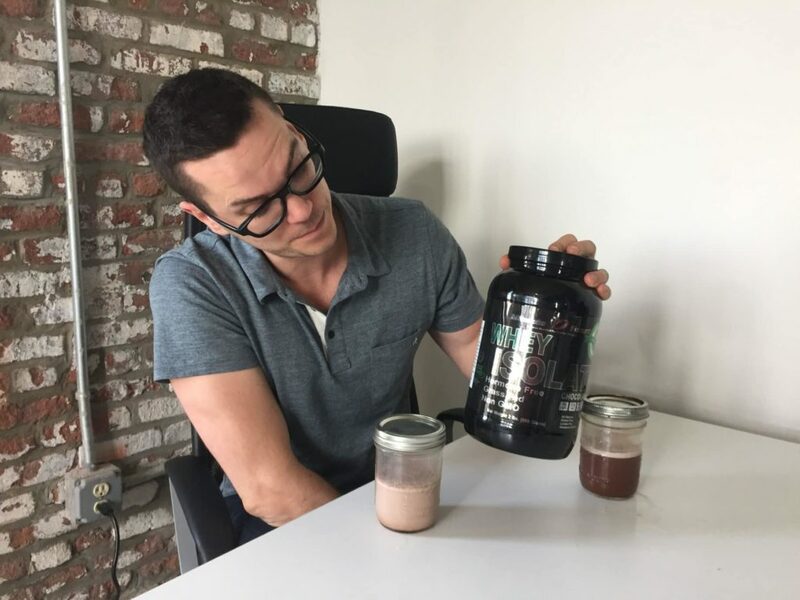 Home » Muscle Feast Grass-Fed Whey Isolate Review — Why So Cheap? Muscle Feast Grass-Fed Whey Isolate Review — Why So Cheap? You won’t find Muscle Feast in GNC or Vitamin Shoppe because it’s a wholesale brand — that means it’s cheaper to buy, but harder to get. But they have a strong following online and great reviews from third party testing sites like Labdoor. Based in Ohio, Muscle Feast sells a lot of different proteins, including a hydrolyzed whey and one that’s mixed with oats, but we decided to try their grass-fed whey isolate, which is free of bovine growth hormone, hormones, antibiotics, and artificial anything. Click HERE to learn more about Muscle Feast protein. One scoop has 99 calories, 24 grams of protein, 1.2 grams of carbs (0.4 grams of fiber), and 0.5 grams of fat. That’s almost 90 percent protein by weight, so it can fit into anything from a low-fat to a ketogenic diet. It’s also very low in cholesterol and sodium (15mg and 51mg, respectively) and a scoop provides about 5 percent of your daily magnesium and potassium as well. In addition, the tub helpfully includes the weight of each amino acid per serving, which could be helpful if you’re a bodybuilder or someone who doesn’t consume a lot of complete proteins like meat, eggs, and soy. 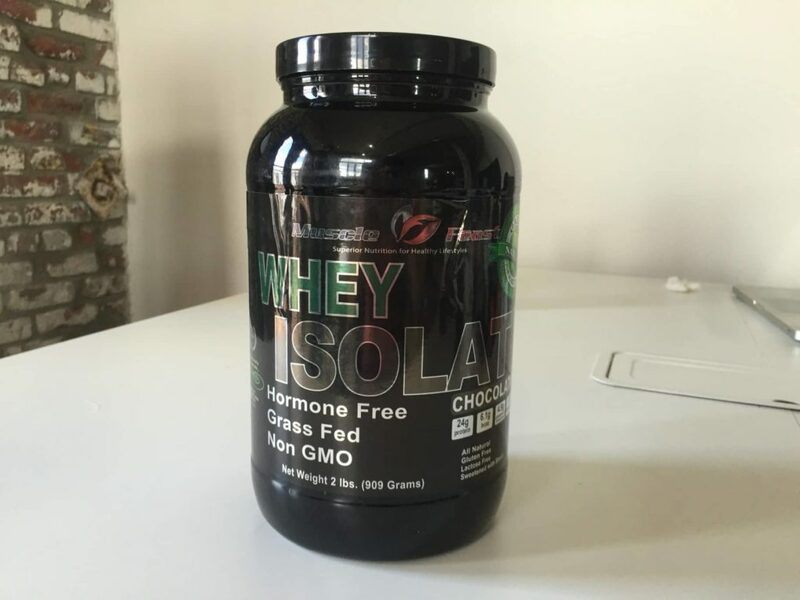 Whey protein isolate, natural chocolate flavor, cocoa powder, sunflower lecithin, and stevia. You’d have a hard time finding a shorter ingredients list than that. It’s not just that there are no artificial sweeteners, there’s also no soy — which might be a plus if you’re concerned about the alleged effects on testosterone — and no digestive enzymes, which might be a negative if you have trouble digesting protein powder. However, Muscle Feast’s isolate is lactose-free, so it’s unlikely (though not impossible) that it will cause stomach upset. The whey is grass-fed, and it’s important to point out that there are likely few real health benefits of consuming grass-fed whey. 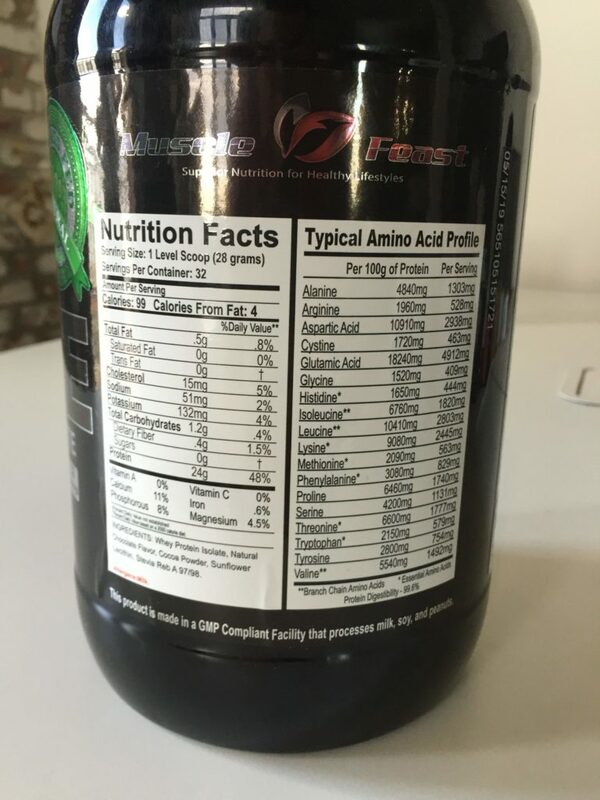 There are benefits to consuming grass-fed beef, as it has a better fatty acid profile than grain-fed beef, but since this protein powder is all but fat free, you’d have trouble justifying paying extra on a health basis. However, the cows that produce the whey are free range, which you may prefer. They’re also free from antibiotics and hormones, apparently unlike the other whey powders sold by Muscle Feast, which don’t claim to be hormone- or antibiotic-free. There are no fancy enzymes or added taurine or extra creatine or any other bells and whistles for this product. It is straight up protein with some natural flavors and a little lecithin for mixability. It’s sleek and functional, and there’s nothing wrong with that. You can grab 2 pounds on Amazon for $34 and that’ll get you 32 servings. That winds up at $1.06 per serving, or 4.4 cents per gram of protein. If you’d rather opt for a 5-pound tub, the price drops to 84 cents per serving or 3.5 cents per gram of protein. Compared to Muscle Feast’s regular, non-grass-fed whey isolate, it’s just an extra two dollars for two pounds. Compared to competing isolates, it’s very cheap. (And remember that isolates are the most expensive kind of whey.) It’s cheaper than the isolates from Optimum Nutrition, Dymatize, Allmax, Prettyfit… and those aren’t even grass-fed isolates. As far as ingredients go it’s most comparable to Xwerks, a grass-fed isolate marketed to CrossFit athletes, and that’s 50 percent more expensive. It mixes very well! This was surprising because it contains sunflower lecithin, which I’ve found usually doesn’t enhance mixability as well as soy lecithin. That was a big plus. I tried the Chocolate flavor, which was very smooth and mild. That’s to be expected of a product that’s so low on artificial sweeteners, though it did mean that it was very bland with water. So while I’d suggest sticking to milk for the best experience, it was definitely better than I expected from a stevia-sweetened product. I enjoyed this product. It’s made from free range, hormone- and antibiotic-free dairy from German cows, so it’s imported. And it’s somehow cheap, tasty, has next to no carbs or fat and it contains nothing artificial at all. If you prefer a very bold-tasting protein powder or you want one that tastes great with water, I’d probably direct you to Dymatize Iso 100 instead. If you have stomach issues with protein powders that don’t have enzymes, you might not like this product. But otherwise, I don’t think you’ll have any issues fitting this very versatile whey isolate into your diet.